Produktinformationen "Dalai Lama: Daily meditation, source of inner peace (russian) - Fribourg 2013 - Set -"
The «Lamp for the path to Enlightenment» is a text composed by Atisha (982-1054), a famous Indian scholar and master invited to Tibet in the 11th century in order to re-establish Buddhism following a period of persecution. The text summarises the complete teaching of the Buddha in a way that is easily understood. It is an effective tool for spiritual development, and although written a long time ago, continues to be a source of inspiration within the daily life of large numbers of people. The relevance of the text will be explained by the Dalai Lamas commentary, in a detailed but accessible way, so that the listeners may understand how the mind functions and the causes leading to inner peace. The purpose of meditation is to introduce us to what we really are, to the true nature of our minds, which is fundamentally peaceful and stable. Meditation practice reduces the intensity of our disturbing thoughts while developing others which are a source of an immense inner peace, joy and satisfaction. The term "empowerment" is the translation of the Tibetan word "wang", which literally means "power". In this context "transmission of power" is more accurate. It refers to the transmission of power from master to disciple, in particular the power of wisdom. Tibetan Buddhism is based on the premise that every being has the potential to attain supreme happiness (also called Enlightenment), and the empowerment is part of the process allowing this potential to fully manifest. This empowerment is related to White Tara, one of the most popular deities in Tibet, who symbolises pacification activity and who grants in particular health and long life. Tara, whose names means liberator, is for Tibetans the mother who protects them from all of lifes dangers and difficulties. She represents the female aspect of compassion. The empowerment of White Tara and her practices help in general with having a long life, and in particular, when a person is seriously ill. The transmission of power therefore creates the necessary conditions for each practitioner to develop the same qualities as White Tara. This empowerment is open to all. It may be received by non-Buddhists simply as a blessing. 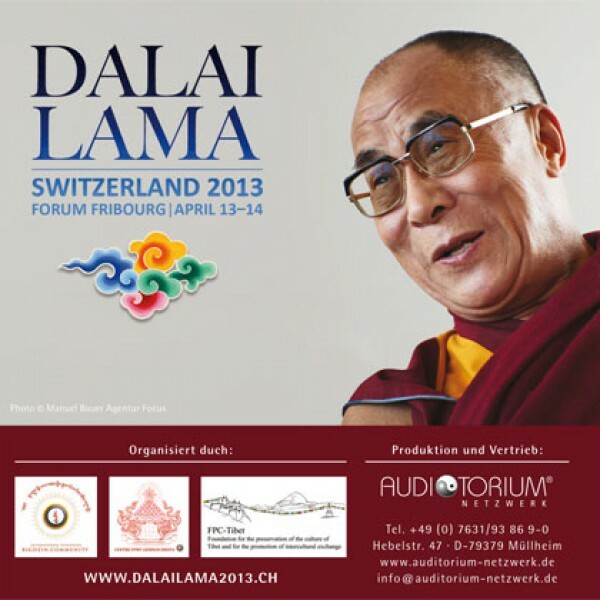 Weiterführende Links zu "Dalai Lama: Daily meditation, source of inner peace (russian) - Fribourg 2013 - Set -"
Kundenbewertungen für "Dalai Lama: Daily meditation, source of inner peace (russian) - Fribourg 2013 - Set -"
Erleben Sie das Oberhaupt der Tibeter in einem Vortrag aus dem Jahre 2005. Insgesamt 28 Stunden dauern die Unterweisungen des Dalai Lama und behandeln alle zentralen Themen des Buddhismus. Im Mittelpunkt stehen zwei grundlegende Texte zur Philosophie und Praxis des Buddhismus. Beide sind wesentlich für die spirituelle Übung und Meditation. Eine einzigartige Einführung in die buddhistische Weisheitslehre.